The further we make our way into the future, the less we, as humans, are willing to compromise things like physical space. We want all of the horsepower and the most efficiency in the smallest package. Take, for instance, Nissan’s new Leaf boasting over 100mpg in a tiny, lightweight hatchback. This new mind-set has carried over into the guitar world quite a bit. We’re now scaling down Wah pedals to a baby’s foot! In the realm of tone, there hasn’t been such a thing as a no-compromise guitar pedal that can deliver tone, options, and save space on the board. You’ll be losing in at least one of three of those categories, unless of course, you’ve decided to take Xotic’s line up of mini pedals for a spin. The Xotic EP Booster deserves to have it’s own blog, really. The EP sets out to replicate that texture provided by a vintage Echoplex, minus the echo part. It IS different than a clean boost. It does something magical to the tone that is hard to describe if you aren’t playing through it. The tone is big and clear. It has this way of hollowing out the guitar sound slightly, adding all sorts of warmth while ridding the tone of unwanted muffled fuzzy bits. Those are technical terms, by the way. I’ve found this pedal on just about everyone’s pedalboard, for surprisingly different reasons. Despite this pedal only having 1 volume control and a couple of EQing devices internally, it has endless applications. I bought one because I was jealous of Mesa’s “Solo Boost” when I was using other amps. I thought this was an equal or better candidate for the job. With +20dB boost on tap, there’s no way you’ll ever be buried in the mix when this pedal engaged. The internal DIP switches offer a “Bright” and “Gain” boost. With the “Bright” switch on and “Gain” off, this setting gives you a much more usable “Bright” switch than most amps, giving you loads of shimmery highs. Pair that with your favorite delay for all of those pretty ballads, while couples slow dance the night away to “Forever Young.” With the “Gain” on and “Bright” off, the EP will kick the front end of the amp hard without accentuating any high end for a big smooth break up. Both DIP switches on gets the SERIOUS lead boost I mentioned earlier. Both DIP switches down and a low to moderate volume control can serve as a great line driver that will compensate for any loss in highs and lows throughout the signal chain. The Xotic EP Booster is a must have for any serious musician’s toolbox. The Xotic SL Drive is a breathtaking recreation of a Marshall Super Lead and Super Bass in the same sized enclosure as the EP Booster, which can be fit in place of your Altoids container full of picks, and still have plenty of room for activities. I know what everyone is thinking. “Oh great, another M-I-A-B. Just what the world needs!” Honestly, I felt the same way at first. I’ve grown tired of pedal manufacturers coming and going, claiming they found a way to give me Van Halen tones from a 9 volt battery. Xotic is one of the few manufactures that I trust to provide the goods every time, and the SL Drive is no exception. My first impression was that this pedal really focuses on the microscopic details of a Marshall breaking up. It wasn’t just some generic, scooped, and fuzzed out distortion. The amp felt different. Four interal DIP switches can be found on the inside of the pedal for various voicings. I got all the nice grainy saturation one would expect from a Super Lead on 10 (set in Super Lead mode with the two outside switches up). I liked this pedal best in the Super Bass mode (The first three switches down and the fourth up), where I got a lower gain thick, chucky rhythm tone out of it. The tone was just full of character. I could’ve spent all day in there tweaking and re-voicing the pedal. Maybe the most impressive part about this pedal is how well it cleans up. This is an absolute MUST if you dare to produce a pedal with the Marshall brand involved. The Xotic SL Drive cleans up just like you were plugged into a real 1959 model. I dug it, so I put it to the test at a local stage that night to see how it would perform in a band setting where it was required to be dynamic and adaptable. It worked out just fine, especially when I got to do my Jimi bit, featuring All Along The Watchtower where it was tested the most as a dynamic rhythm pedal, but when the time for a solo came, (fairly often in that song) it had to be a scorching Marshall lead tone ala the Monterey Pop Festival. I was very pleased and got the nod from fellow guitarists in the crowd. The Xotic SL Drive passed with flying colours. The Xotic SP Compressor is another one for the serious musician’s toolbox. It’s based off of the Ross compressor, sharing the same OTA. Personally, I barely ever use a compressor pedal, but this one piqued my interest. It’s a pretty versatile little guy that comes in at a very reasonable price point. The SP has a lot in common with the EP and SL. The SP is housed in the same box with four internal DIP switches. The DIP switches in this pedal might offer the most variety out of all the pedals in this series. You can really get any sort of compression you could ask for out of this pedal. Again, I haven’t spent a whole lot of time with compressors in general. When presented with the opportunity to use one at a show, I generally try to set it up as a “barely on” level that allows me to retain most of my original tone, but refined and sits better in the mix. The SP shines on this setting because it really doesn’t bastardize your sound much at all. Depending on the specific application, you could probably leave this on all the time. The only other compressors I’ve tried that are as transparent will put you out more than double the cost of the SP. The other setting I really loved this pedal on was set up as a “Clean Solo” boost, where my tone was just straight clean sustain for days. This worked especially well considering I play strats, and can’t ever find the right way to solo on the notch positions without it getting buried. Whether this is the end-all be-all compressor or not is a decision for someone else to make, but for someone like myself, this pedal is perfect. Xotic Effects can do no harm, as far as I’m concerned. There isn’t a bad or even mediocre pedal in the bunch. They’re all great! The mini pedals are toneful, versatile, easy to use, and built like tanks. 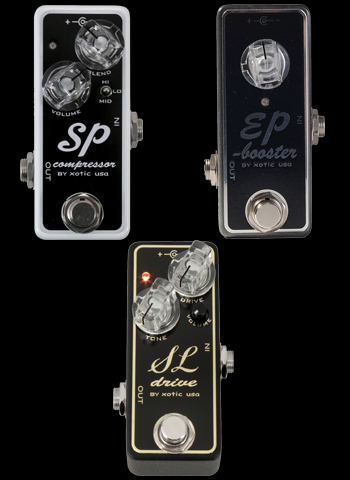 The EP and SP especially are pedals that serve as multi-functional tools that will reinvent themselves in your rig, time and time again. The SL sounded and felt super authentic with superb dynamics. All of these pedals are within reach, too, under $150. Hat’s off to Xotic for not compromising.